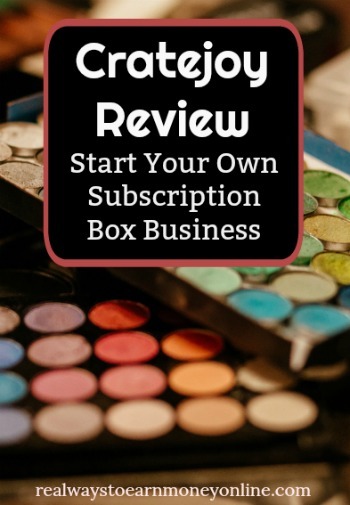 Cratejoy Review – Start Your Own Subscription Box Business! Published June 27, 2018 By Anna J. This post may contain affiliate links. Regardless, I only recommend sites I've researched and/or used and trust. The first time I ever received a subscription box was a part of a free trial that I ended up staying with for over two years. It was Birchbox, of course, the cosmetics subscription box company that offers box subscriptions at $10 per month, $30 every three months, and $60 every six months. In a Birchbox, you’ll receive high-end cosmetic, skin, and hair care items from companies like Ouai, a favorite hair care company of It Girls everywhere, and Stila, to name only two of the many companies affiliated with Birchbox. Products typically arrive in sample size form, but still – not too shabby for ten bucks per month. Why Are Subscription Boxes Such a Big Deal? The genius behind subscription boxes is that for a relatively affordable rate (basically the cost of a Netflix subscription), you will receive products that you may not be able to afford otherwise. That, to just about anyone, is a great deal. Subscription boxes also provide boxes to remote parts of the country – I started receiving my first box when I lived in a small Southeastern town in middle-of-nowhere Georgia. It was thrilling to open up my box of makeup on a humid summer day and have new toys to play with! I have also purchased box subscriptions for friends, family, and clients, because, of course, they make great, unique gifts. Having had all of this experience as a box consumer, I have often thought to myself, “Why don’t I start my own box subscription service?” The answer was simple: I had no idea where to start. That is, until, I stumbled upon Cratejoy. This subscription box company not only allows box entrepreneurs to start their own subscription service through their easy-to-navigate platform, but they also sell the newly implemented box services to the public on their website. So not only do you get all of the tools that you will need to figure out where to begin creating your subscription box service, but you will also get ecommerce included in Cratejoy’s services. Absolutely anyone can use Cratejoy to start their subscription box service with little overhead cost. This is, of course, a work-from-home job (unless you have a production facility, which, if so, then good on you!). Custom-built website for your box service. Analytics for your storefront and Marketplace – meaning, Google should easily find you! A free listing on the only subscription box marketplace – i.e., Cratejoy! “Shipping and tax-smart checkout” – Cratejoy does the math for you. Your customer’s checkout experience is customizable to their location and yours, and Cratejoy helps you automatically figure out shipping rates based on weight, price, order total, etc. Fulfillment manager and subscription logistics. Utilizes and integrates seamlessly with payment gateways (i.e., Stripe, Authorize.net, and PayPal). Plus, Cratejoy has customizable website/storefront templates so that your ecommerce store truly feels like your own brand. Cratejoy also integrates with other CMS platforms you may already utilize, like MailChimp or ShipStation and provides Google Analytics for your listing, so that you can view where you stand on the SERP rankings. How Much Does Cratejoy Cost? You are likely wondering about the meat of this deal, i.e., the cost! A Cratejoy pricing plan runs $39 per month + 1.25% + $.10 of sales on your website and +11.25% + $.10 of sales on the marketplace. Your payment processor – meaning PayPal or whatever platform you use – may take out additional fees, so be aware of that. Fees and monthly costs are normal, and Cratejoy has really cornered the market in this industry. Once you launch, how do you figure out how to grow and scale? Cratejoy has that covered as well. Monitor your KPIs (Key Performance Indicators – i.e., the numbers that tell you how your business is doing, growth-wise) through churn and cancellation analytics on your dashboard. View traffic reports without any marketing integrations. Easily look at cash flow reports. The entire Cratejoy platform is user-friendly, even for the layman who has yet to learn the joys of owning your own ecommerce business. Learning how to scale your subscription box service is easy, too, with Cratejoy. With the aforementioned KPI tracking, you can easily see where you need to put in more effort, and with API integration, you can easily manage your fulfillment center. Cratejoy’s API will “feed” into your selected payment system for simple integration, lending to both you (and your customers) having the ultimate online shopping experience. Cratejoy also provides a multitude of resources on their website, including webinars and other tools to help you get started fast. But prior to doing your research on Cratejoy, you must decide on the most important aspect of your subscription box services – the items that you are selling and your customer, of course! Nail down your brand and who your target audience is – niches are important in any business, and a subscription box service is no exception. Do this, and Cratejoy does the rest. Go here to get started with Cratejoy, or just check out the site.